It's not just the green in our sauteed kale or string beans you've been noticing lately, it's your neighbors and friends beginning their St. Patrick's Day celebrations! We can't think of any better excuse to add extra green veggies to our meals than to celebrate such a fun and festive holiday, but we can think of a great family-friendly activity you can do with your kids. Our favorite holiday tradition is creating the amazingly delicious, nutritious, and beautiful fruit rainbow! Rainbows signify not only the hiding place of leprechauns, but also the pathway to gold at the end of the rainbow so this activity will be sure to get all children excited. 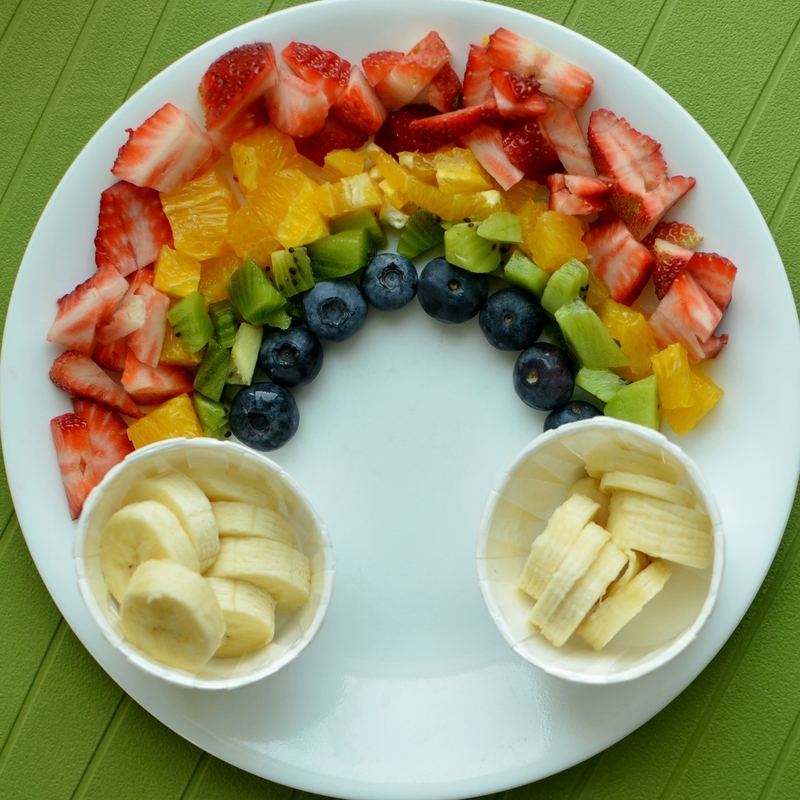 This activity requires several different kinds of fruit in order to get the full rainbow effect. Depending on how big you want yours to be the amount of fruit will vary, so keep that in mind when you're slicing and dicing. Feel free to take some liberties and mix and match fruit however your child or you imagine the rainbow! First, wash the strawberries and then cut them in half lengthwise. Lay them along the outside of a white plate while alternating the tops and bottoms of the berries so they fit perfectly together. Slice the cantaloupe in half and first scrape the seeds and pulp out. Then, cut each half into thin wedges and carefully peel the skin off. Place the cantaloupe slices beneath the strawberries with the freshly cut skin side against the berries. Cut and peel the pineapple open and then slice it into small pieces. Place the pineapple right up against the cantaloupe slices. Give the green grapes a wash then place each individual grape beneath the pineapple OR grab a kiwi and give it a quick peel. Cut the kiwi into slices and try them out beneath the pineapple. Similar to the green grapes, give the red grapes a quick wash and place them below either the grapes of the kiwis used on the above layer. Now, for the blueberries! Grab a handful, give them a quick wash, and then place them beneath the red grapes. Lastly, take a little paper or plastic white cup and place it beneath the two ends of your rainbows. Peel your banana, cut it into thin slices, and put the bananas into your little cups. Voila, you have a fruit rainbow with special "gold" at the end of the rainbow. While we can't promise a fruit rainbow as part of next week's menu, please take our Menu Survey to let us know what you and your children would like to see this spring!